Who is ready for more football? Here are 14 Super Bowl recipes as well as some ideas for the National Championship game tomorrow night with Alabama and Notre Dame. Tomorrow is a big night for us living in Alabama, and so I decided to put together my Super Bowl recipe list for you early. I hope everyone had a great holiday break. My kids go back to school tomorrow, and I can’t believe three weeks has gone by so fast. They love this Turkey Tortilla Soup recipe and all of the other 13 recipes below. Enjoy for football or party entertaining anytime of the year. Mini Calzones from Ingredients, Inc.
Lightened Up Mexican Layer Dip via Ingredients Inc.
Rosemary Infused Nuts via Ingredients Inc. Spinach Dip with Greek Yogurt via Ingredients Inc. Dark Chocolate Brownies by Ingredients Inc. I had so much fun on “Talk of the Town” yesterday in Nashville. I thank my Nashville friends, Lisa and Rob, News Channel 5 and all of the Nashville subscribers and facebook fans for tuning in to watch me. 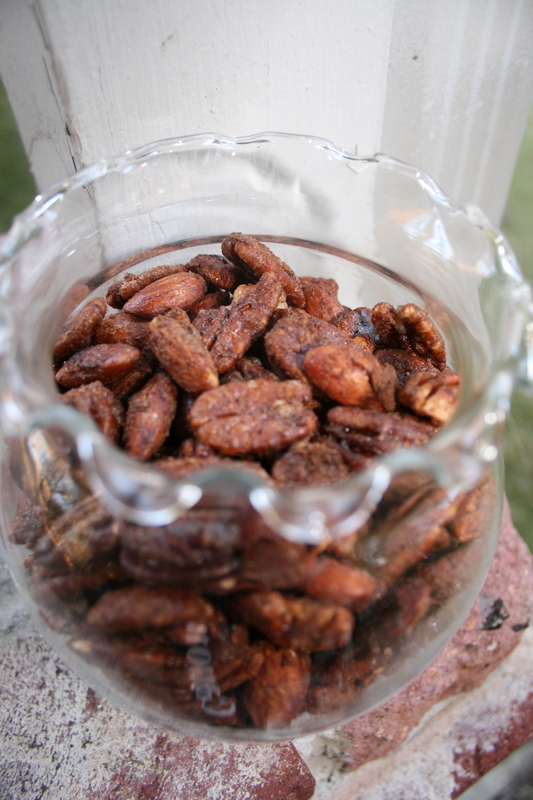 One of the recipes I shared was this Spiced Nuts mix which I posted before Thanksgiving. It was very popular and is perfect for Super Bowl Sunday. It’s a lower-fat nut recipe and is ideal for a Super Bowl Party, holidays, or you can enjoy them as a snack or also tossed in a salad. Feel free to use any type of nuts that you want. These are worth every bite, and there’s no oil or butter in the recipe. 2. Combine pecans, almonds and next 3 ingredients in a large bowl. Stir in egg whites. Spread mixture evenly onto a foil-lined baking sheet coated with cooking spray. Bake at 325° for 10 minutes. Stir mixture; bake an additional 10 to 15 minutes or until crisp. Transfer foil to a wire rack; cool almond mixture. Break almond mixture into small pieces. Note: Store at room temperature in an airtight container for up to one week. 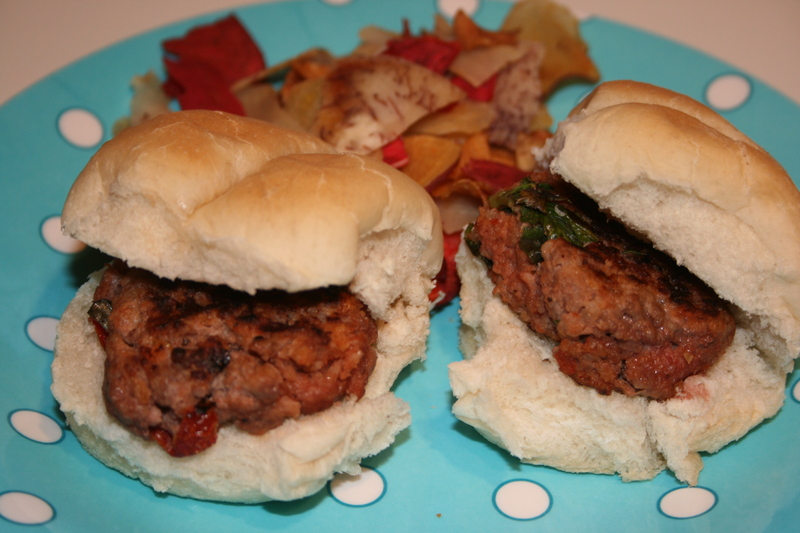 Okay, I am having a slightly busy week…all because of these Tomato-Basil Sliders. I am in Nashville to be on WTVF News Channel 5 “Talk of the Town” on Friday, and I will be in Birmingham on WBRC Fox 6 TV on Saturday morning preparing this recipe and a few others for Super Bowl Sunday that I will post in the coming days. These proportions also work perfectly as a meatloaf in a 71/2- x 4-inch pan. 1. Combine first 8 ingredients in a large mixing bowl. Divide dough into 8 equal portions, shaping into a 1/4-inch patty. Lightly coat with cooking spray. Place patties in a grill pan and grill 3 to 5 minutes each side or until done. Serve on cut sides of rolls and top with marinara, ketchup and lettuce, if desired.